To investigate the age-related course of best-corrected visual acuity in healthy eyes. Two hundred participants (400 eyes) 25 to 74 years of age (114 females, 86 males) were investigated, 20 per 5-year age group. Best-corrected visual acuity was measured monocularly with the ETDRS 2000 charts at a distance of 4 m (Precision Vision, Woodstock, IL, USA). Strict exclusion and termination criteria were used. Visual acuity did not change between ages 25 and 54 years (mean of the better eyes, − 0.18 ± 0.05 logMAR). A significant age-related break-point in visual acuity was found at the ages of 55–59 years. For all age groups, the overall mean visual acuity was − 0.15 ± 0.06 logMAR for the better eyes and − 0.13 ± 0.06 logMAR for the worse eyes. There was no difference between the right and left eyes (− 0.14 ± 0.06 logMAR). The visual acuity was better in the right eye in 29% (n = 58) of the participants, better in the left eye in 32% (n = 64), and the same in both eyes in 39% (n = 78). From ages 25 to 64 years, neither the better nor the worse eye had a visual acuity worse than 0.0 logMAR. Best-corrected visual acuity was constantly high until the age of 54 years. An age-related break-point appeared at 55 to 59 years of age. Until age 64, a minimal angle of resolution smaller than 1 min of arc (visual acuity better 0.0 logMAR) can be expected in healthy eyes. 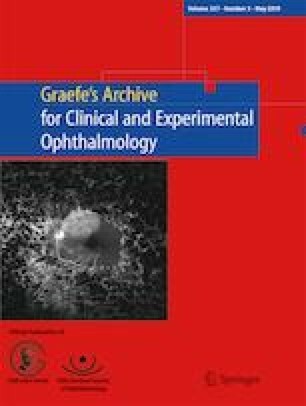 The study was supported by the “Adele Rabensteiner Fonds” of the Austrian Ophthalmic Society. The study has been reviewed by the Ethical Commission of Vienna. All procedures performed in studies involving human participants were in accordance with the ethical standards of the institutional and/or national research committee and with the 1964 Helsinki declaration and its later amendments or comparable ethical standards.